School outreach is an important community role for the Centerville-Washington Park District. Our naturalist is in high demand for classroom presentations and field trips. Retired science teacher Sue Meyer joined our volunteer team last year, and has increased our outreach capabilities tremendously! She helped us reach more than 2,200 school children with quality nature education in 2016, and is on track for even more in 2017! Sue grew up in Kettering, graduated from Alter High School, and then obtained her degree from The Ohio State University. 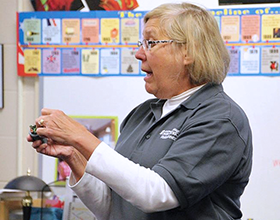 She taught science for 29 years, 24 in the Beavercreek school district, before retiring. In her free time, Sue likes to play pickleball and golf. She and her husband enjoy traveling to visit National Parks. “After I retired, I found I really missed working with kids and teaching science. Volunteering for CWPD gives me the opportunity to do this on a part-time basis,” says Sue. We, and our local schools, are lucky to have the benefit of Sue’s science knowledge and teaching background!